Simoni Mnguni, Zulu homestead (umuzi) of woman pounding mealies, signed, watercolour, 28 x 35.5cm. 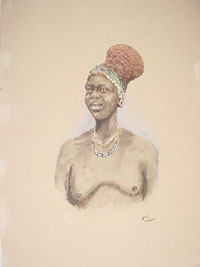 Simoni Mnguni, Head and shoulder portrait of a married Zulu woman wearing an isicholo, signed, watercolour, 34 x 48cm. Sfiso KaMkame, Dialogue with the past, woodcut and oil on paper, signed and dated 2007 and 2008, numbered 3/10, 66.5 x 102cm. 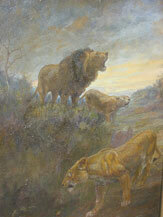 Edmund Caldwell (1851 - 1930), Lions at dawn, oil on board, signed and dates 1918, 39 x 29cm. Caldwell illustrated Fitzpatrick's classic South African children's novel Jock of the Bushveld (1907). Thomas Baines (1820 - 1875), Brilliant Meteor on the Zambezi River, 1864, oil on canvas, 46 x 66cm. A superb Baines painting by the artist at the apogee of his skill. Exceptional provenance. 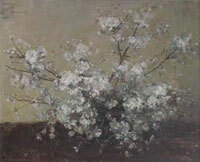 Adriaan Hendrik Boshoff (1935 - 2007), Still life with white blossom, oil on canvas, signed, 85 x 105cm. Thomas Baines, The Buffaloes visit the Lady at the Olifants River, oil on canvas, signed and dated 10 Jan 1874. 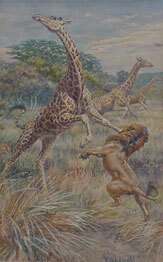 One of a pair of paintings commissioned by Edmund Byron as a memento of a hunting trip to the Kruger Park area in 1873. A rare painting.